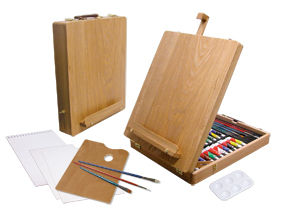 A wooden art case for the artist that paints in all mediums. This set includes 12 Essentials oil paints, 12 Essentials watercolor paints, 12 Essentials acrylic paints, 2 white bristle brushes, 2 taklon brushes, 2 white nylon brushes, 2 canvas boards, 1 watercolor pad, 1 wooden palette, 1 plastic 6 well palette, and 1 artist box easel. Great for mixed media painters, because it has oil, acrylic, and watercolor paint. The typical search from our site is initiated by the words, art supplies oil paints, acrylic paint set, and oil paint supplies.